Keychain Pepper Spray, convenient, effective self defense. There is no comparison, this is a better formula for less money, period! Same OC content as bear spray. Total Capsaicin and related capsaicinoids tested at 1.4%. The minimum for bear spray is 1.0%. No middleman, we get these direct from the factory, made in USA! Contains one half ounce of the nastiest 2 MM SHU pepper spray from Police OC-17 and UV dye to assist identification. This manufacturer makes a great product and goes out of their way to ensure quality that no one else does. They have every batch they make assayed by an independent outside lab to ensure the potency of their contents. 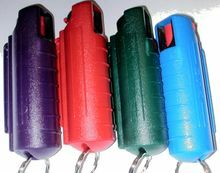 Most other contract pepper spray companies ask the manufacturer to make it as cheap as possible to pad their profits. Not so with Police Magnum. This formula is "bear spray strength", guaranteed. Range is 8-10 feet. Easily get 10 or more bursts. Spray pattern is a splatter stream. Green color model has been discontinued. We cannot ship Police Magnum pepper spray to NY, MA, WI, HI, AK,. Pepper spray cannot be shipped by air, only ground service can be used. Please make your choice in the drop down menu.